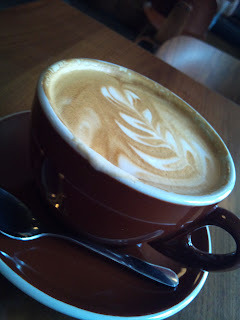 The very first cafe latte I ever had was in Bolinas, California in 1992. It was prepared for me by my friend Ann, in her kitchen, using her espresso machine. The first time I was offered a latte in a paper cup with the abomination of a plastic top on it would have been sometime late in 1993, when we moved to Seattle. The persistence of this ill-fitting plastic horror continues to impress me, for I find that not only does it ruin the smell, flavor and texture of hot drinks, it works poorly as a lid. This morning I found myself with about fifteen minutes to kill before the pet food store opened, and I was in an unfamiliar neck of the woods. Outside of airports or long road trips, I do not frequent Starbucks, disliking their ambience, pastries, sandwiches, in-a-hurry sales staff, and burnt-tasting coffee, to say nothing of the other customers. Today, I found there was a Peet’s Coffee, which I recall from my mandatory coffee history classes in business school was founded by the original Starbucks guys as a less commercial and more authentic alternative. I am sorry to report that the pastries were, to a muffin, exactly what one might find in the Starbucks of the B Terminal of Sea-Tac Airport. I settled for an almond poppy-seed muffin, which does not usually disappoint. My drink, a twelve ounce non-fat latte, which I ordered “for here,” was served in a shapely mug, with no saucer. The foam was floating on top like a huge marshmallow, having been unceremoniously dumped there in a blob. What kind of a coffee snob have I become? Because I frequent small independent coffee shops in Seattle, like Kaladi on East Pike, I have grown to expect the rosetta on top. It’s pretty. It takes practice to make. It places the milk foam on the surface of the latte in a uniform layer that lasts but does not slide onto your face. I like it. There were almost as many cantankerous pre-schoolers in the coffee shop as there were adults, which did not improve its ambience. One was unable to sit but silently paced back and forth before his mother’s table like a bear in the zoo. A clutch of loud ones were given sixteen ounce drinks with big green straws jammed in the ill-fitting plastic horrors known as lids; this is a huge drink for anyone. One drink fell, but did not spill. Another was thrown, producing a pond of lukewarm beige sugar-milk, which the adults scurried to clean up with handfuls of flimsy napkins. That, and the faint drift of crumbs already on my dingy table made me upend my latte onto my face, and turn and rise to stagger across the parking lot into an unfamiliar pet food store. A more detailed history of Peet's and Starbucks is that the founder (Mr. Peet) taught the Starbucks founders (4 of them, I think) how to roast coffee. Back then, Starbucks was more like Peet's: primarily a specialty coffee roaster. Later, Starbucks was bought by a group headed by Schultz, with a vision of a chain of Italian style coffee bars. The original founders left and some eventually bought Peet's.